The Seattle Schools let out on Tuesday. I took a few days off work and spent the balance of the week at home with the boys doing not terribly interesting things like getting them new sneakers and jeans. Because of bad planning (mine) and a bad tummy (not mine) we ended up having to make two separate journeys to the mall. We rounded out the weekend with a trip down to see Wes's parents while his brother, uncle, aunt and cousin were visiting, hosting a sleepover (younger son, going to a birthday party (also younger son) and taking George to two dog training classes. 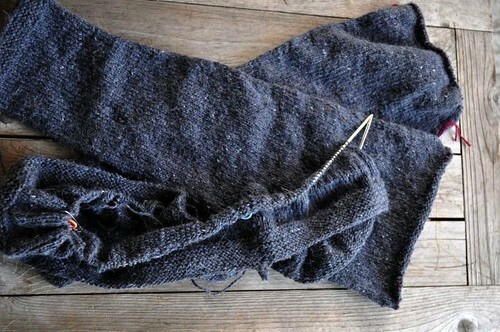 I did manage to finish the second sleeve on Lloie's Cardigan and start the body. My hope is to finish this in time for Knitting Camp which is startlingly soon. Last night, to keep older son from disturbing younger son's sleepover, I watched Jaws with him. He's not like me. He doesn't scare easily. Watching it with him was just like watching Lord of the Rings with him--and endless barrage of questions. "Is he going to die?" "Do they get eaten?" "Are they all going to die?" In the end he declared the movie awesome. Which it is. But I doubt he'll be going swimming in the ocean any time soon. So maybe it is not the best idea to watch Jaws with the visiting 14 year old nephew. I was going to get it from the library, but it was filmed here (Martha's Vineyard) We go swimming at the beaches where a lot of it was filmed.